Posted by FTR ⋅ December 27, 2005Post a comment Email This Post Print This Post Tweet This! Introduction: Beginning with an interview with the remarkable John Loftus, this broadcast highlights the circumstances surrounding the acquittal of Sami al-Arian—a close political ally of George W. Bush. In addition to his close relationshio with Bush and other prominent Republicans, “Sammy the Aryan” is a leader of Palestinian Islamic Jihad, a terrorist group and offshoot of the fascist Muslim Brotherhood. After reviewing the story of his lawsuit against al-Arian, and how that suit led to the Operations Green Quest raids of 3/20/2002, John Loftus discloses that Judge Moody made al-Arian’s acquittal a sure thing with his instructions to the jury. Judge Moody told the jury they must acquit, if the prosecution could not prove that the money al-Arian raised for PIJ was used to commit a terrorist act. After the interview with Mr. Loftus, the program reviews the al-Arian case, including his links to Bush, the GOP, the Muslim Brotherhood, and a milieu that financed al Qaeda. The broadcast reviews several other irregularities that led to the acquittal of al-Arian, a proven terrorist who was under the protective wing of the White House and the Republican Party, as well as the Saudi political and economic elite. Program Highlights Include: Review of the “accidental” destruction of key documents in the al-Arian case; review of the fact that the statute of limitations had expired for many of the crimes with which al-Arian should have been charged; review of the fact that many of al-Arian’s criminal co-conspirators were outside of the reach of the federal government and could not be brought to trial; review of the links between Grover Norquist, Karl Rove, Bush business partner and political ally Talat Othman, the SAAR network, the Bank Al Taqwa (and its head–former Nazi spy Youssef Nada) and Sami al-Arian; al-Arian’s presence and activities in the United States as an extension of the doctrine set forth in The Project, discussed in FTR #537. 1. 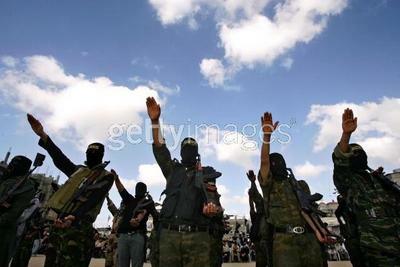 An excellent way to begin this discussion is the presentation of a picture of a 4/15/2005 rally by Palestinian Islamic Jihad, the Muslim Brotherhood offshoot to which Sammi al-Arian belongs. (Al-Arian is referred to by Mr. Emory as “Sammy the Aryan”—a direct reference to the Nazi and fascist character of the Muslim Brotherhood.) Excused by Western apologists as a “democratic” group, the Muslim Brotherhood—including its branch organization Palestinian Islamic Jihad—is anything but democratic. Check out this picture, which reveals in stark fashion the true nature of the group to which “Sammy the Aryan” belongs. 10. Another factor in the acquittal of Bush’s buddy Sami al-Arian was the fact that many of the conversations linking him to terrorism occurred before the official designation of Palestinian Islamic Jihad as a terrorist group in 1995. As will be seen below, another factor dictating the acquittal of Sammy the Aryan may well have been the “accidental” destruction of key documents by federal authorities. 11. In evaluating the acquittal of Bush’s Buddy, remember the role in these events of Harken Energy director (and political ally of George Bush Sr and George Bush Jr) Talat Othman. (Harken Energy was one of the younger Bush’s failed energy companies.) Othman gave a Muslim benediction at the Republican convention, and was a director of Grover Norquist’s Islamic Institute—a central element of the GOP’s connections to the world of Islamic terrorism. Norquist served as a lobbyist for many of the Islamists involved with the GOP milieu, including Sami al-Arian. Be sure to note Othman’s role in interceding with then Treasury Secretary Paul O’Neill on behalf of the targets of the 3/20/2002 Operation Green Quest raids, which were spurred by John Loftus’s suit against al-Arian. (Othman’s intercession with O’Neill is discussed below, and in—among other programs—FTR#’s 356, 357, 376, 454, 462, 464, 467.) The discussion reviews some of the Muslim terrorist links to Norquist, Bush and company. 12. Norquist’s Islamic Institute significantly overlapped individuals and institutions targeted in the Operation Green Quest raids of 3/20/2002. A summary account of those raids and the investigation into the SAAR foundation and the Safa trust follows: As will be seen below, Sami al-Arian was part and parcel to this milieu. Again, it was John Loftus’s lawsuit against al-Arian that precipitated these raids. 19. Do not fail to take note of the role in the SAAR/Safa Trust milieu of Cherif Sedky, a lawyer for Khalid bin Mahfouz. Like the bin Laden family, the bin Mahfouz family are business partners with the Bush family. 20. The Operation Green Quest raids were triggered by a raid on the Sami al-Arian, the terrorist, supporter of Bush and associate of Norquist. 23. More about al-Arian and the Safa Group. Note that the monies flowing to al-Arian from the SAAR/Safa Group was sanctioned for use by al-Arian and company through different front groups. Compare this with the strategy proposed in the Muslim Brotherhood document The Project, discussed at the end of this description and at length in FTR#537. 25. Bush associate Talat Othman, a director of Norquist’s Islamic Institute, went to bat on behalf of the targets of the Operation Green Quest raids of 2002. O’Neill was fired roughly seven months later. 26. Is it a “coincidence” that federal employees in Tampa “accidentally” destroyed key paperwork in the al-Arian case? !